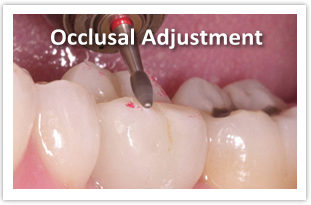 Occlusal Adjustment. This is the painless procedure in the modification (slight reshaping) of the biting surfaces of the teeth in order to develop a harmonious relationship between the teeth, jaw muscles and temporal mandibular joints (TMJ). The occlusal procedure removes tiny interference’s that keep teeth from coming together properly. Occlusal interference’s can prevent the jaw from closing in its anatomically correct position. Interference’s can develop as teeth develop, can occur following an accident, or they can accumulate over time with wear. Dental work such as fillings, crowns, bridges, and extractions can also cause interference’s. Interference’s can prevent the jaw from fully sliding into its anatomically correct position. This means that the muscles of the jaw and neck are never able to fully relax. This may result in severe headaches and neck aches. Many develop bruxism, or teeth grinding, as their jaw seeks its natural position. Bruxism can cause bone loss, tooth loss, and receding gums. Overtime, patients may develop tempromandibular joint issues, or TMJ, if they go untreated. How can I know if my bite is off center? During your examination, your doctor will examine your jaw closely and may notice symptoms that your bite may be off. Symptoms can vary from the jaw not opening evenly on both sides, the jaw makes a clicking noise as it opens, the enamel has been ground away in certain areas, or there are fractured teeth. Chronic symptoms of bruxism, headaches or neck aches, are also clues that the bite may be off.